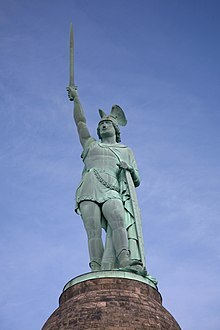 The Statue of Herman (German: Hermannsdenkmal) is a monument in the Southern part of the Teutoburg Forest, in the district of Lippe, North Rhine-Westphalia in Germany. The monument commemorates the Cherusci war chief Hermann or Armin (Latin: Arminius) and the Battle of the Teutoburg Forest in 9 AD when the Germanic tribes under Arminius fought three Roman legions and other troops under Varus. Deutsche Einigkeit, meine Stärke - meine Stärke, Deutschlands Macht. German unity (is) my strength - my strength (is) Germany's might. The monument is 53.46 m (173.39 ft) tall and was built according to plans by the sculptor Ernst von Bandel. Building for the statue was started in 1841, but was not finished until 1875 with the help of a lot of money from the state of Prussia. When building was started Germany was made up of lots of small countries. Most of these were united into the Second German Empire in 1871, after the Franco-Prussian War. The monument was seen as one of those heping to remind people of Germany's history and national pride. A similar Hermann Heights Monument exists in New Ulm, Minnesota, a town settled by German immigrants. Wikimedia Commons has media related to Hermannsdenkmal. This page was last changed on 25 March 2018, at 12:34.